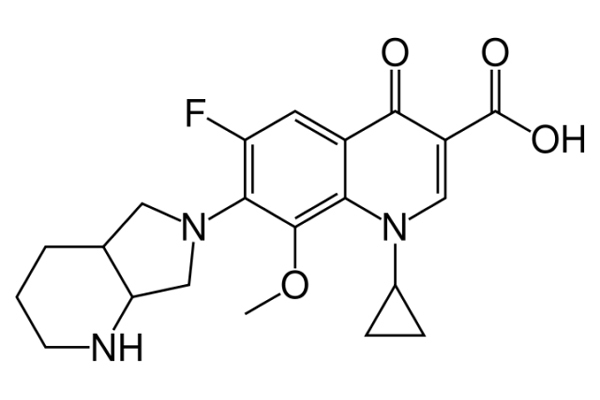 Moxifloxacin is an 8-methoxy fluoroquinolone - a subset of the quinolone class of antibiotics. Developed and marketed by Bayer HealthCare AG as Avelox, moxifloxacin was approved to treat several acute respiratory and uncomplicated skin and soft tissue infections. It is widely used in countries all around the world. Though it is sometimes used as a second-line TB drug, it does not have regulatory approval for use against TB or MDR-TB, although it was studied as part of the REMox TB trial and in the NC-005 trial. Moxifloxacin acts by inhibiting an enzyme called DNA gyrase, which is essential for bacterial survival. At the same time, moxifloxacin has little interaction with the cytochrome P450 enzyme system, which is heavily involved in the metabolism of some of the antiretroviral drugs (ARVs) used to treat HIV/AIDS. Therefore, moxifloxacin is an ARV-friendly TB drug candidate.